Power — what is it, where does it originate, and how do we access that resource? 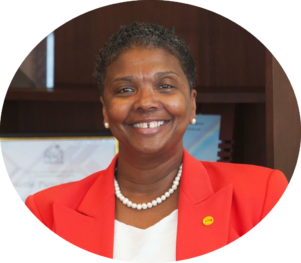 Dr. Colette Pierce Burnette, president and CEO of Huston-Tillotson University, taps into her unique experience as a trail blazer and educator to address how community provides professional and personal empowerment. At Huston-Tillotson, she inspires more than 1,100 students and more than 100 faculty and staff members. Partnerships are being created such as Texas Wildlife and Parks and Merck and Company and first-time internships for students such as PayPal and local software company Planview. For someone of Dr. Burnette’s caliber and with her breadth of knowledge, many boards want her membership. A few of her current local board memberships include the Mayor of Austin’s task force on Institutional Racism and Systemic Inequities, Girl Scouts of Central Texas, and Greater Austin Black and Austin Area Chamber of Commerces. Nationally, she serves on The Ohio State University’s College of Engineering Advisory Committee and the National Association of Schools and Colleges of the United Methodist Church Board.